I’m not a religious person, nor am I an Atheist. I believe what I believe and let others do the same. Lately, for some reason, I’ve felt like going to church. I’m really not sure why, it’s just something I feel like doing. 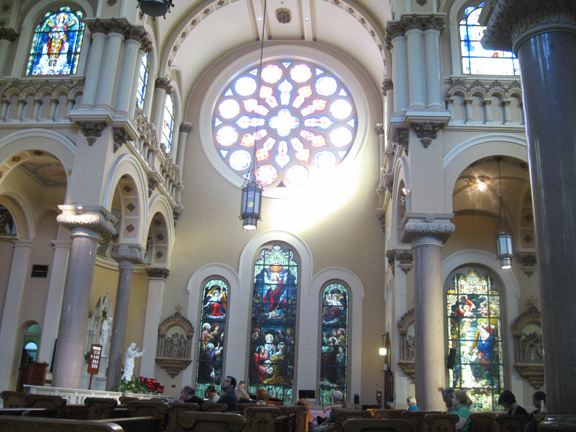 There’s an absolutely gorgeous Catholic church here, Sacred Heart. It’s just a beautiful place to sit and think for an hour. In a post a while back, you said you have used drugs and alcohol to relieve stress. Can/ do you smoke marijuana at all? There’s something about that that seems absolutely classless. I never thought to brew it. Good suggestion! I watched the movie “Super High Me” a few weeks back, about a comedian who ingests marijuana every day for a month straight and it showed that they have all sorts of methods to ingest cannabis now, such as candy bars, gum and suckers, which is good for those with lung cancer or asthma. I use it for my CPS and fibromyalgia and it seems to help. Although it may help more to kill the mental anxiety of the symptoms rather than the symptoms themselves, but I have not a care in the world after a couple of inhalations. Back to the topic at hand. The church seems very beautiful from the picture. I am glad you have belief. I am a Buddhist, and although bodhisattva is situated in the Vajrayana path, I believe you are the very expression of one. I have enjoyed watching your segment on the television and thank you for your words. This church IS absolutely gorgeous. Maybe we could go together sometime.